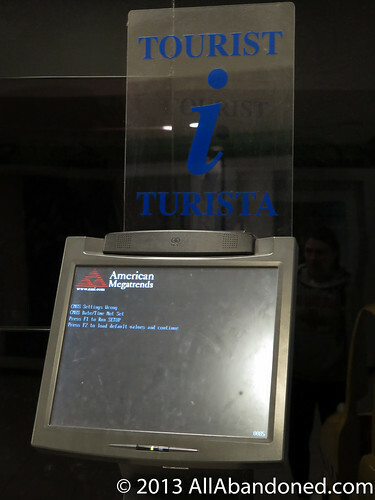 This kiosk had apparently seen use elsewhere, perhaps in the old terminal, as evidenced by the amount of use apparent on the touch screen. Interestingly the kiosk had apparently been sitting around plugged in for quite some time. The error on the screen read "CMOS Date/Time not set," indicating that the battery on the motherboard had perhaps died while it was stored away. A technician will need to come by and replace the battery or this error will appear every time the kiosk is powered up.